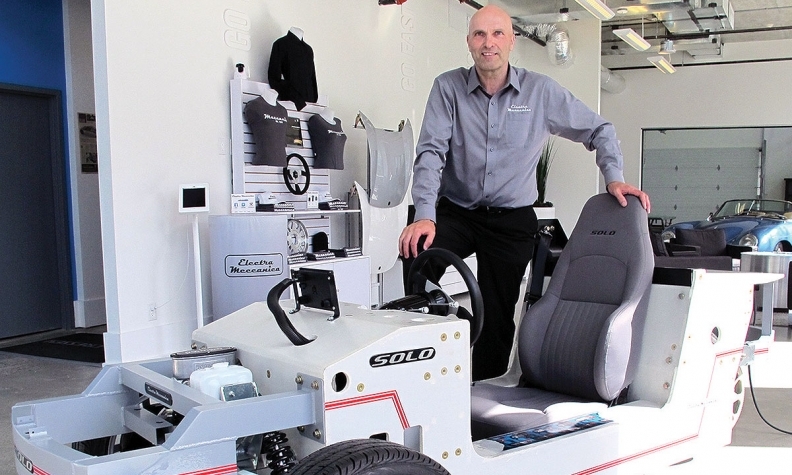 The bones of the Solo three-wheeler are good for 160 kilometres on a charge, according to entrepreneur Jerry Kroll. VANCOUVER, B.C. — Jerry Kroll believes driving a conventional automobile will one day be as socially unacceptable as smoking. He’s doing his bit to bring that day a little closer; the Vancouver entrepreneur’s company, Electra Meccanica, is set to launch its Solo three-wheeled electric commuter vehicle in September. Kroll is unfazed by the possibility Canadians might balk at paying $19,888 for a single-seat car (thus Solo). Or that less than 7,000 four-wheeled EVs were sold in 2015 out of almost 1.9 million in total vehicle sales in Canada. “It’s a huge market,” he said in an interview with Automotive News Canada. Kroll said 83 per cent of commuters travel alone in their vehicle on two-way trips of 60 kilometres or less. “And yet people commute by themselves in big four- and six-passenger vehicles and wonder why there’s so much traffic congestion,” he said. The Solo has a claimed range of 160 kilometres and a governed top speed of 130 km/h. Although it would be licensed as a motorcycle, Kroll said the 500-kilogram Solo will exceed automotive safety standards through the use of lightweight aerospace composite materials. Kroll’s commitment to EVs is longstanding. Around 2000 he began importing the Sparrow, a one-seat battery EV, from California. It became a test bed for the Solo. Kroll spent several years in California where his KleenSpeed Technologies developed “wicked quick” electric race cars. Returning to Canada, he connected with Henry Reisner of Intermeccanica, which builds custom replicas of the 1950s Porsche 356 and VW Kubelwagens. They have partnered in Electra Meccanica, which is producing the Solo at Intermeccanica’s suburban Vancouver plant, overseen by Reisner while Kroll woos investors. Kroll put $2 million of his own money into developing the Solo before Electra Meccanica was incorporated in February 2015. It has raised another $3 million to take the car into production, with its official debut Sept. 9 at the Luxury and Supercar Weekend show in Vancouver. The New Westminster facility can produce between 10 and 20 Solos a month, said Kroll, but he’s aiming much higher. Discussions with companies in China, India and Eastern Europe are under way to produce up to 100,000 Solos beginning in the first quarter of 2017, Kroll said. All major components also are sourced offshore but Kroll has been trying to get the federal government to help fund a larger assembly facility in Canada. “We can build the cars in Canada; there’s no magic to it,” he said. Kroll is looking for $50 million in federal funding. He made a presentation June 14 to the Commons Industry, Science and Technology Committee. So far, no call back. A government-relations consultant hired by Electra Meccanica advised Kroll that convincing Ottawa that Solo fits in with the Liberal government’s objectives on climate change and urban transportation is a longer-term process. “Our hope is they’ll be supportive,” said the consultant, who did not want to be named. Meanwhile, Kroll is trying to raise another $10 million from private investors. After the Solo’s debut, the company will file for a listing on the OTCQB Venture Market, a U.S. over-the-counter exchange for small startups. There are no plans for a full public offering, he said. Electra Meccanica will mirror Tesla’s online sales/marketing model. Customers can reserve a vehicle now with a $250 refundable deposit. A network of local showrooms will have modest service facilities to handle small repairs because, Kroll said, there’s nothing much to fix.